This algebra software is for getting algebra help by learning algebra begins with the basic algebra concepts of solving algebra problems: Real Numbers, Simplifying Expressions, Order of Operations, Properties, Operations on Real Numbers, Basic Equations in One Variable, Anatomy of a Word Problem and a large ALGEBRA WORD PROBLEM section including motion problems, coin problems, work problems, and mixture problems. 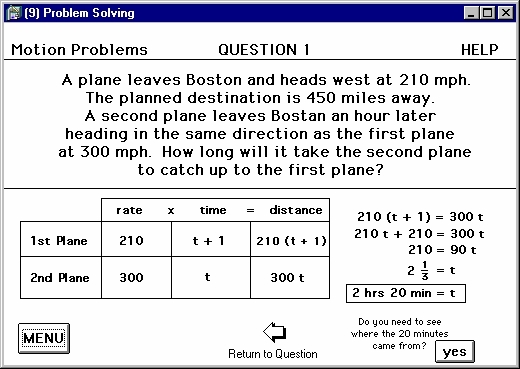 In conclusion, students can test their understanding of basic algebra problems. 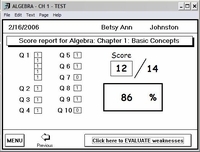 Learning algebra in this learning system is working with math tutor software - algebra help is always available. This interactive educational software provides learning, practice algebra problems with solutions, basic algebra problem solving (word problems) and a comprehensive test. 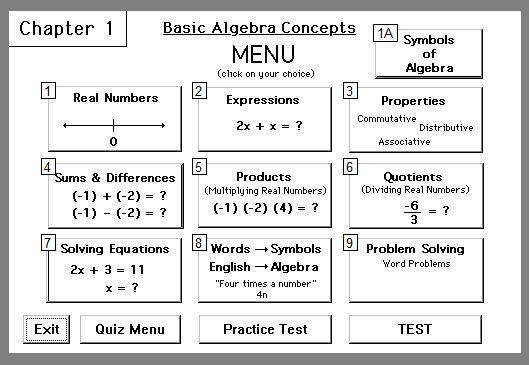 Students who need algebra help will receive it with this self-paced algebra software. 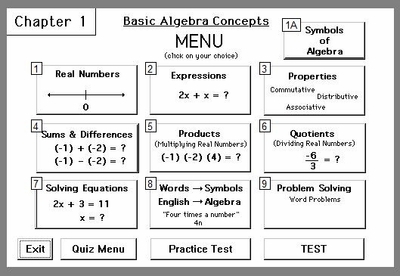 Students taking standard Algebra 1 courses will benefit from the extra instruction and practice provided in this curriculum based educational software. This learning basic algebra software covers the basic concepts necessary for success in a full year course. This is Chapter 1 of a full year Algebra 1 course. Algebra 2 students benefit from the review and re learn basic algebra concepts. Curriculum Note: These 8 chapters of algebra software represent the first semester of Algebra 2 - students planning to satisfy college entrance requirements should complete both the Algebra software by Chapter Series and the Advanced Math Series which would then be the equivalent of 2 years of learning Algebra (Algebra 1 and Algebra 2) including a complete course of Trigonometry.